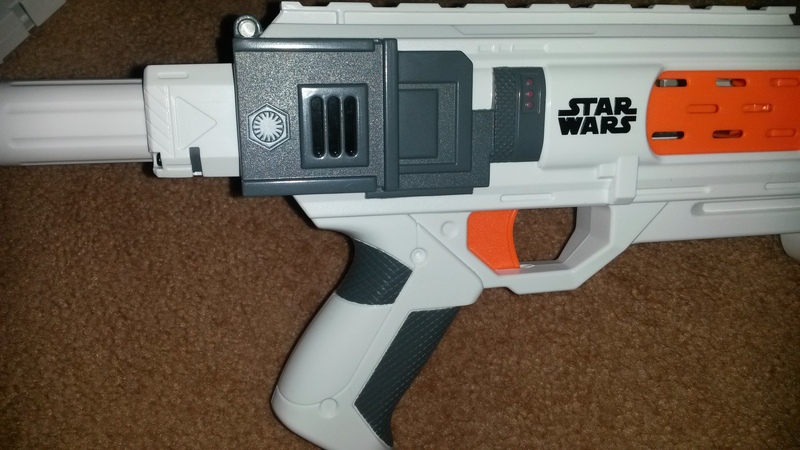 Expensive, but cool looking and quite a good blaster. 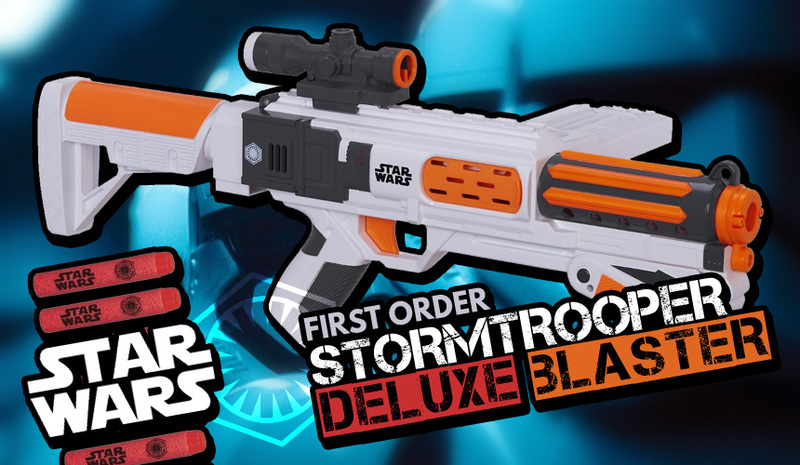 As a massive Star Wars fan, you can probably imagine my excitement when a new set of Star Wars Nerf blasters were revealed. 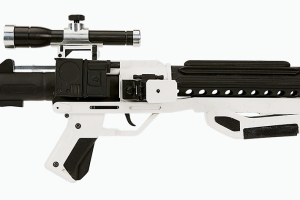 Of particular note is the SW First Order Stormtrooper Deluxe Blaster (which I’ll usually refer to as just the “Deluxe Blaster”), which is a pump action, clip (mag) system blaster. 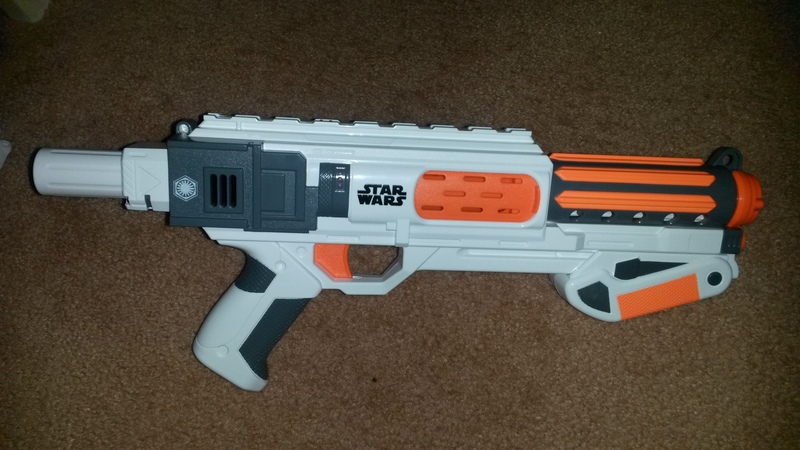 A combat practical, cool looking Star Wars blaster? Count me in! 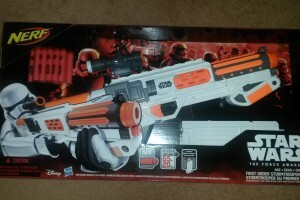 Surely it can’t be all good news though, what’s the catch with the Deluxe Blaster? 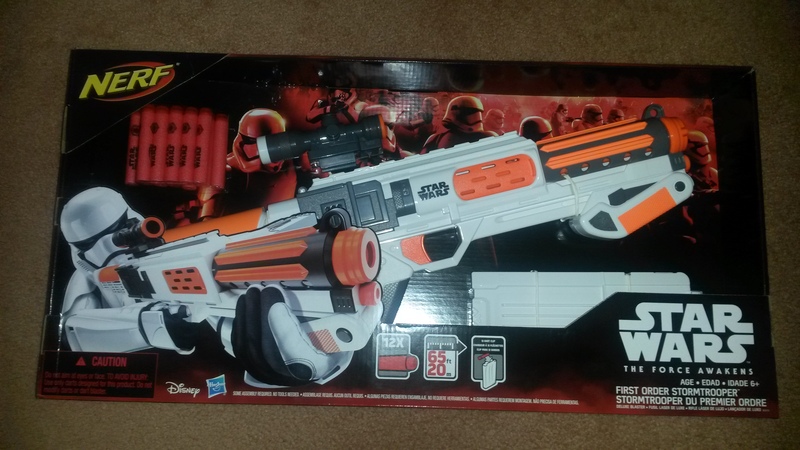 Note that even though this was an Aussie release, the blaster has an orange trigger, with a range claim of 65 feet/20 metres. 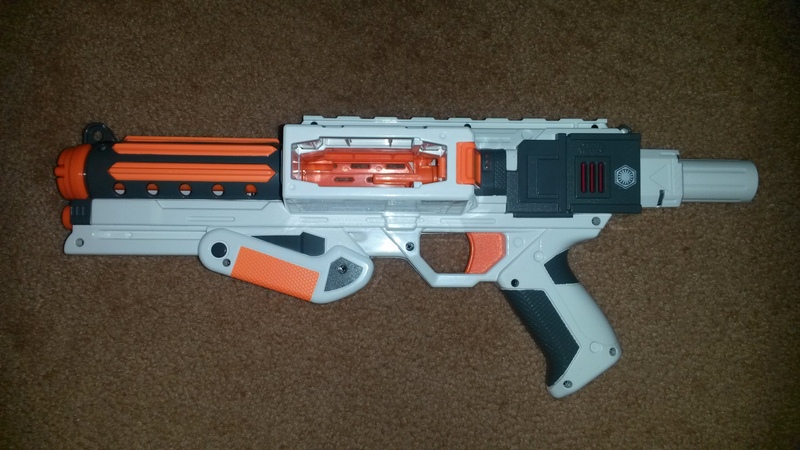 There is no grey trigger/nerfed version, this one is the global release version. 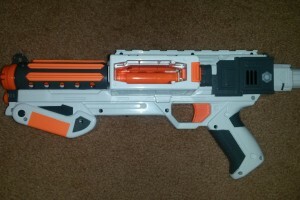 A standard F-11D blaster rifle. Captain Phasma's chromed F-11D. Note the stock. Credit to Wookipedia for these images. 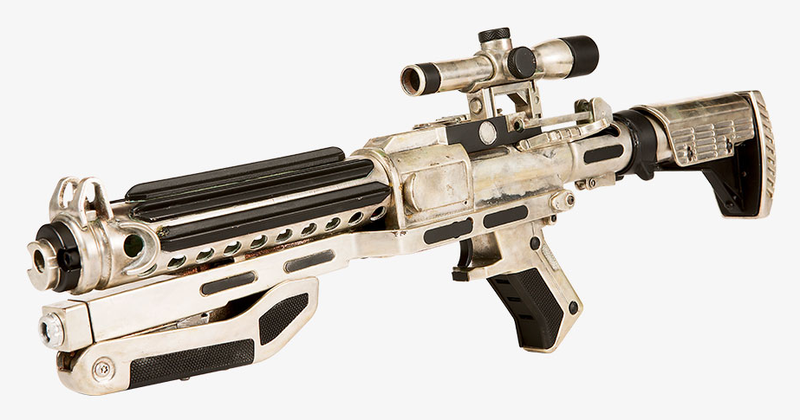 The F11-D is the in-universe blaster that the Stormtrooper Deluxe Blaster was based upon. 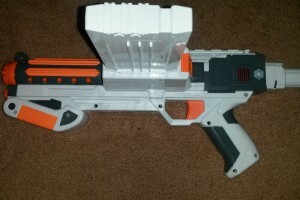 As a first for the blasters I’ve reviewed, the blaster in question will also be judged on accuracy to the source material. 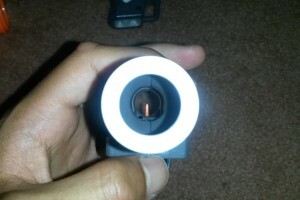 Close up of the barrel shroud. 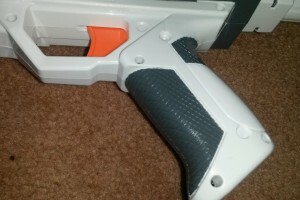 Close up of some right side details. 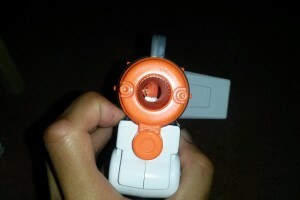 Stock attachment point on the back. 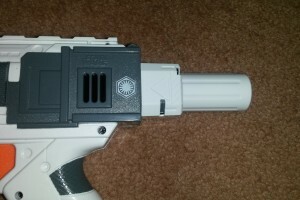 The Stormtrooper Deluxe Blaster is quite different from most Nerf blasters, it has a lot of details like the barrel shroud that Nerf normally wouldn’t put too much effort in to. It’s quite good looking, it has enough of the original colour scheme of the F-11D while still being distinctly toyish. Ridge just underneath the trigger. 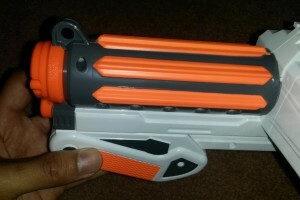 The Deluxe Blaster’s handle is fairly good, though it does have a few issues. 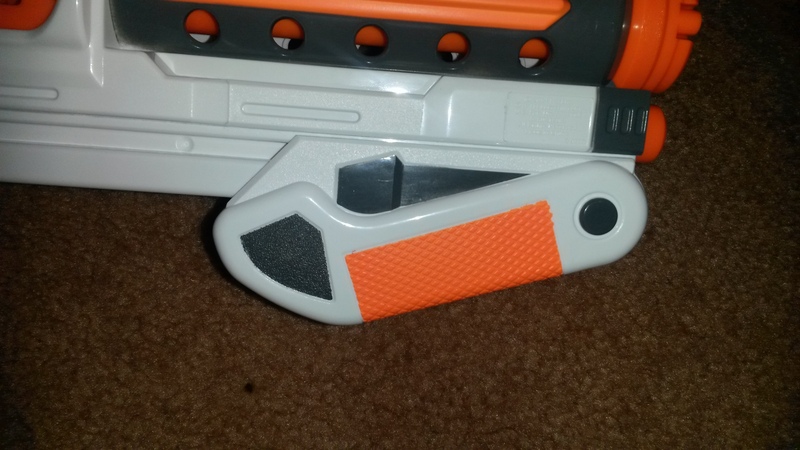 The front of the grip is a little more squared than I would like, I would have preferred a larger curvature. 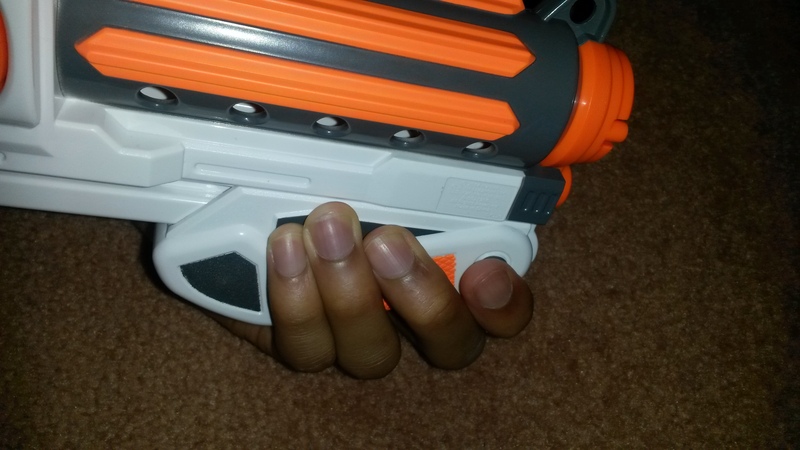 Additionally, there’s a sharp ridge just below the trigger that makes regular middle finger position a little uncomfortable. Overall however, the handle is fairly good. It’s quite a good size, my hand fits in it with room to spare. 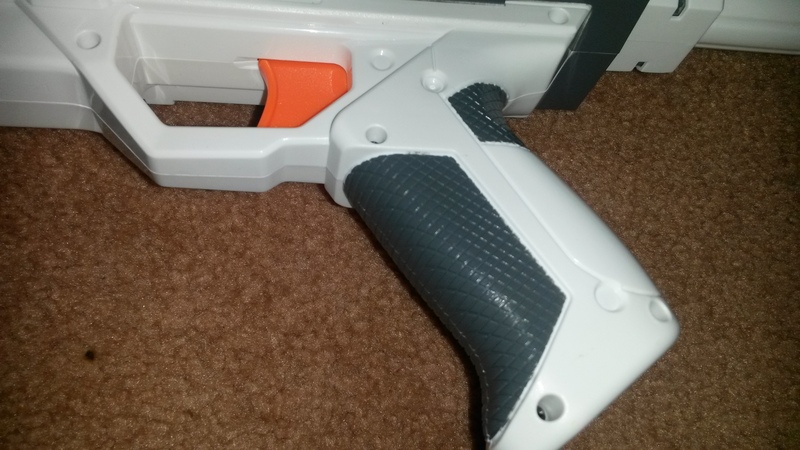 I think the pump is quite well designed. It’s on a slight angle which makes applying backward force much easier, making the prime stroke a lot more comfortable. 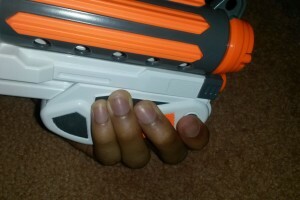 It’s large enough for my hand to fit comfortably, but not so large that it gets annoying. 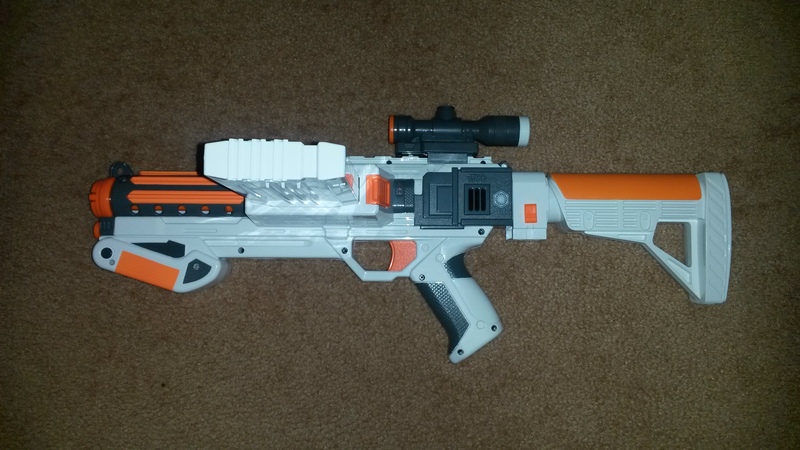 This is especially helpful for slam-fire, as a poor pump design can make slam-fire extremely uncomfortable. 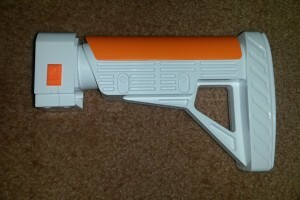 Thankfully slam-fire is quite comfortable and very easy on the Deluxe Blaster. 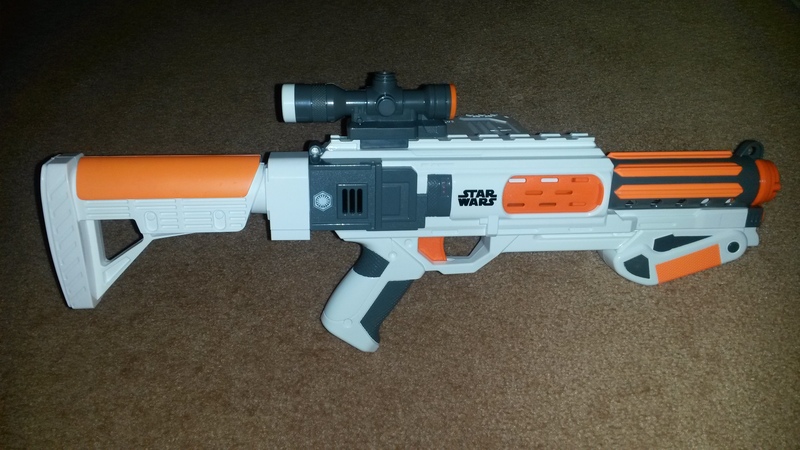 Pump back, blaster primed, breech open. 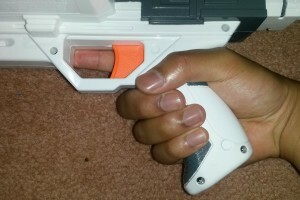 Pushing the pump forward to chamber a dart. 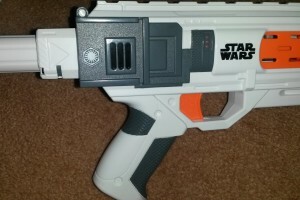 Prime indicator indicating the blaster is primed. 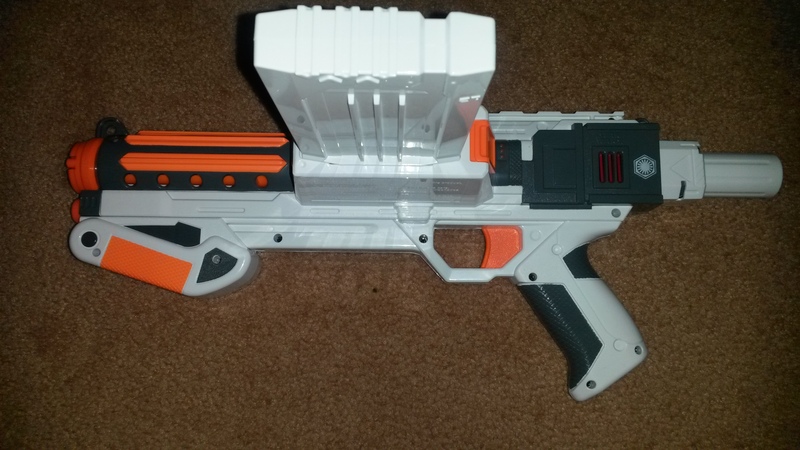 The Stormtrooper Deluxe Blaster operates pretty much the same as all other manual springer clip (mag) system blasters. 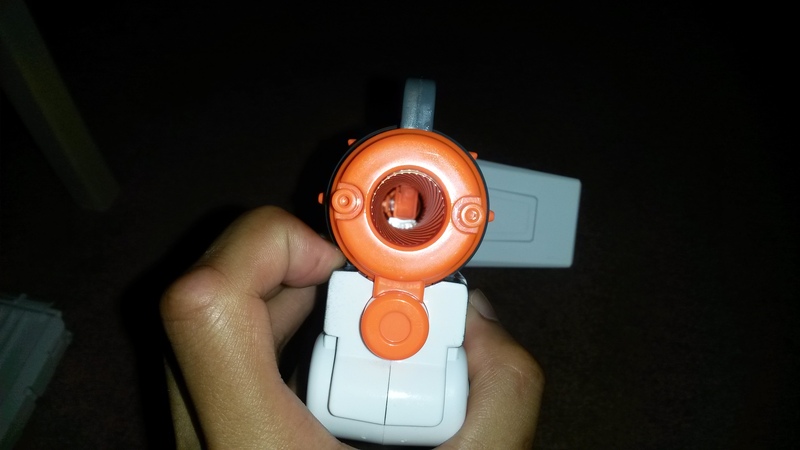 Pulling the pump back opens the breech, allowing replacement/insertion of a clip (mag). 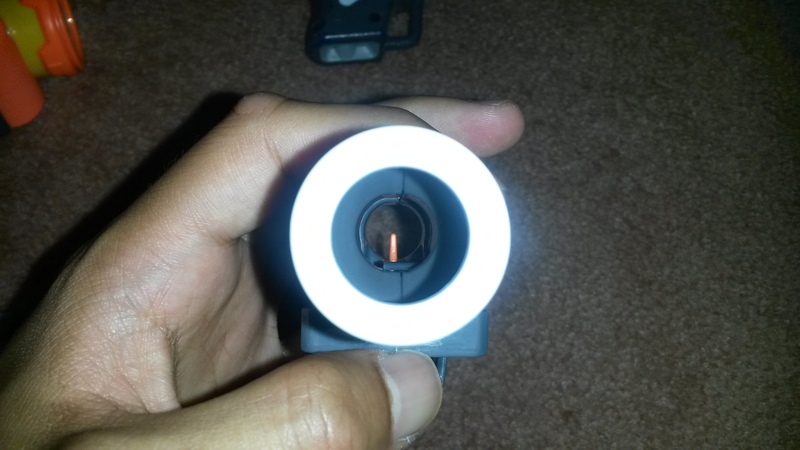 Pushing the pump forward chambers a dart and locks in the clip (mag). 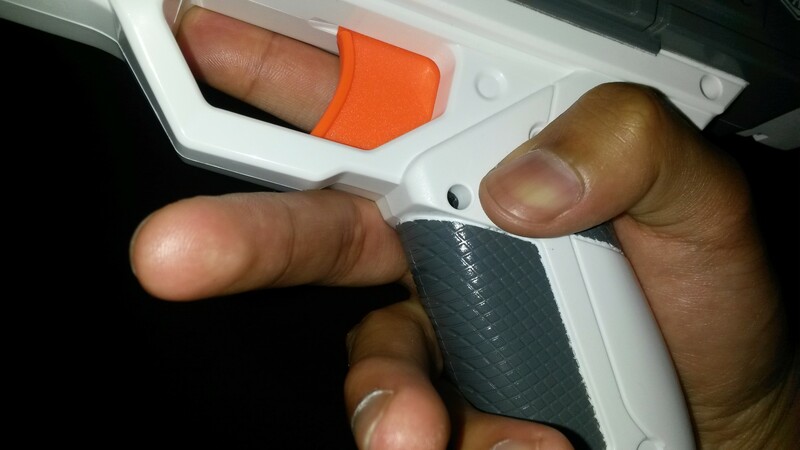 Finally pulling the trigger fires the dart, allowing for a new dart to be chambered. 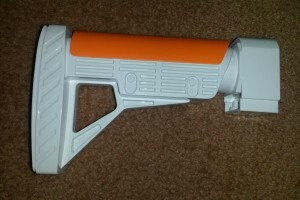 The Deluxe Blaster also has slam-fire, in which the trigger is held down and the pump is cycled repeatedly, allowing for a higher ROF than usual. 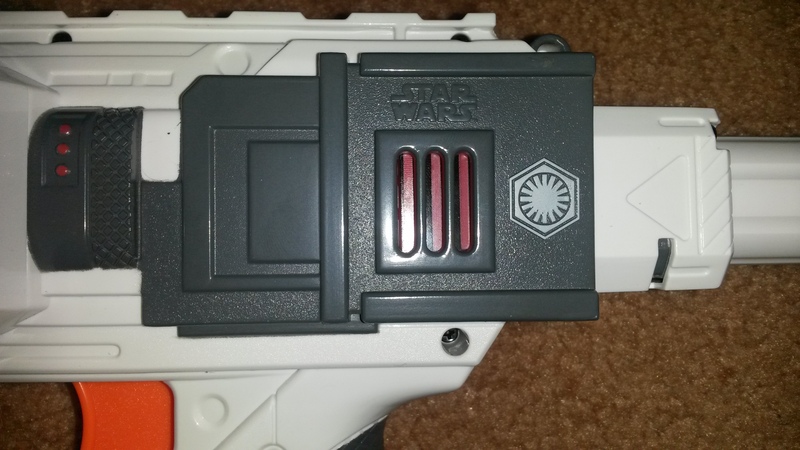 Some faux vents on the back of the blaster act as priming indicators, turning red when primed and returning to black when unprimed/fired. 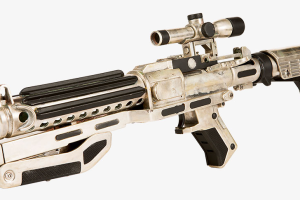 Unlike the Raider on which the Deluxe Blaster is originally derived from, the Deluxe Blaster is perfectly reliable. 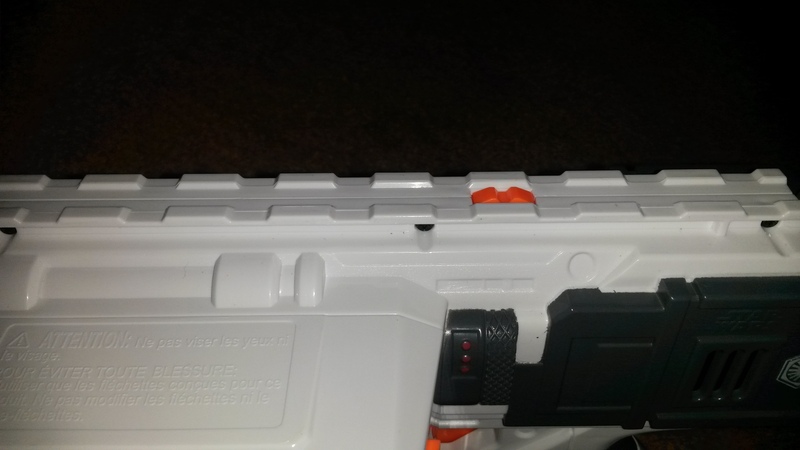 I’ve slam-fired whole clips (mags) through it at full speed with no issue whatsoever. With EPPS, Lightningstorm stock, 6 clip (mag). 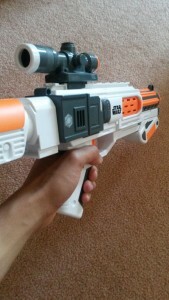 Being that it uses Nerf’s system of attachments, the Deluxe Blaster is compatible with other Nerf attachments, such as the Elite Pinpoint Sight and the Lightningstorm Stock. 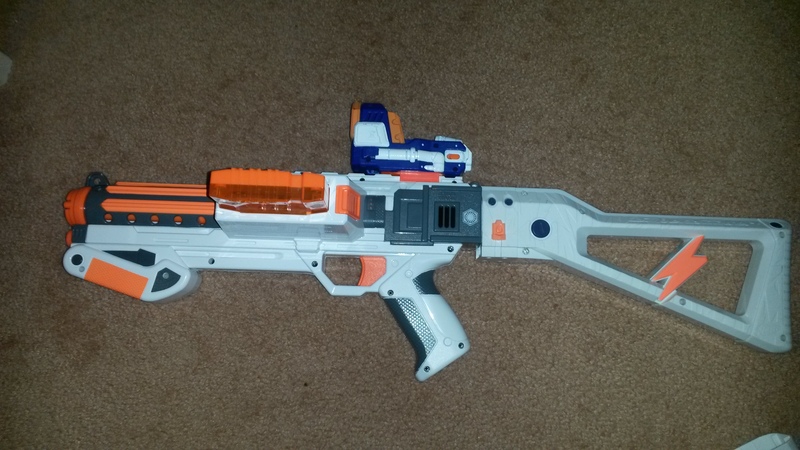 Colour wise, it will match Modulus attachments if you ignore the green. 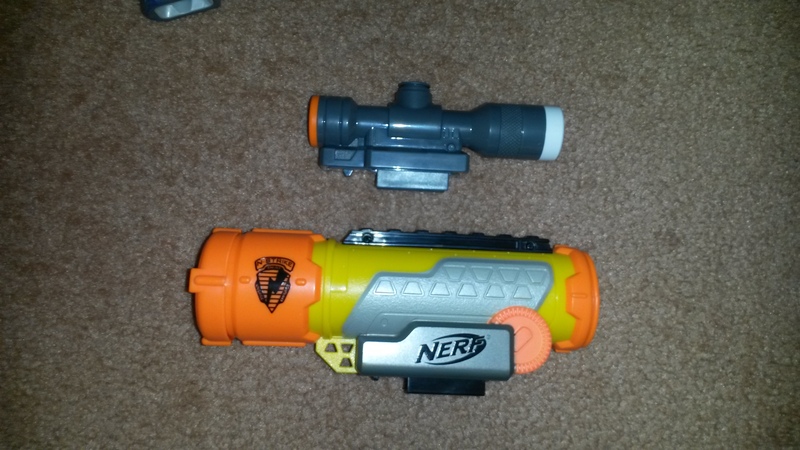 Deluxe Blaster next to an EAT. Handles lined up, notice the difference in stock point position. 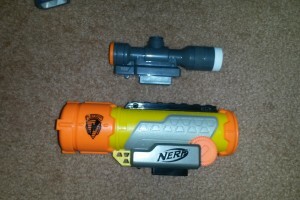 The Deluxe Blaster is actually quite a small blaster, it’s shorter than the already compact EAT. 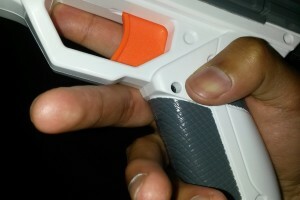 Having its magwell on the side allows the pump to run closer to the trigger, allowing for a shorter length. Besides that, it’s much the same as an EAT or Rampage. 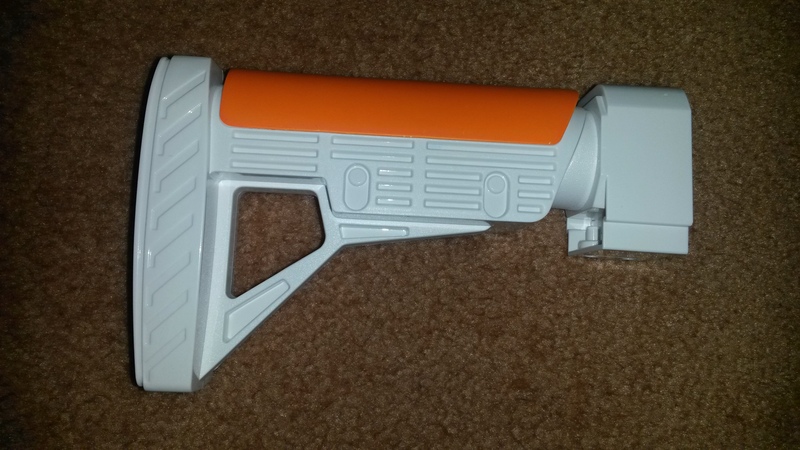 One thing to note is that the Deluxe Blaster’s stock attachment point is further back than usual, as evident in the last picture. This allows it to utilise short stocks (e.g. 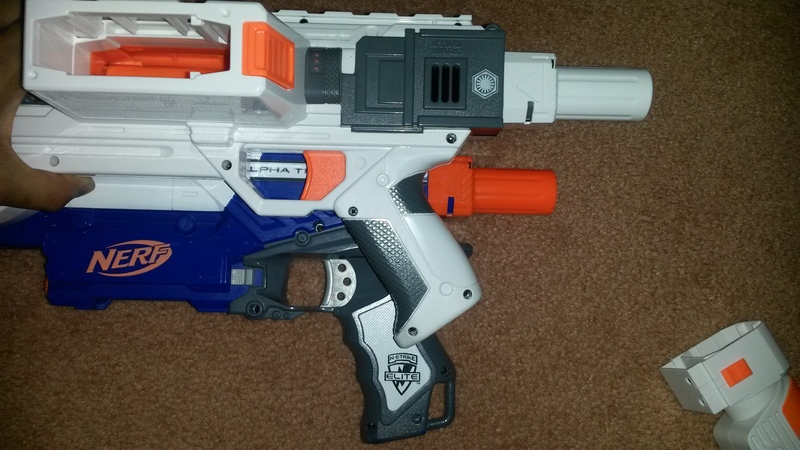 Retal stock) better than most blasters. 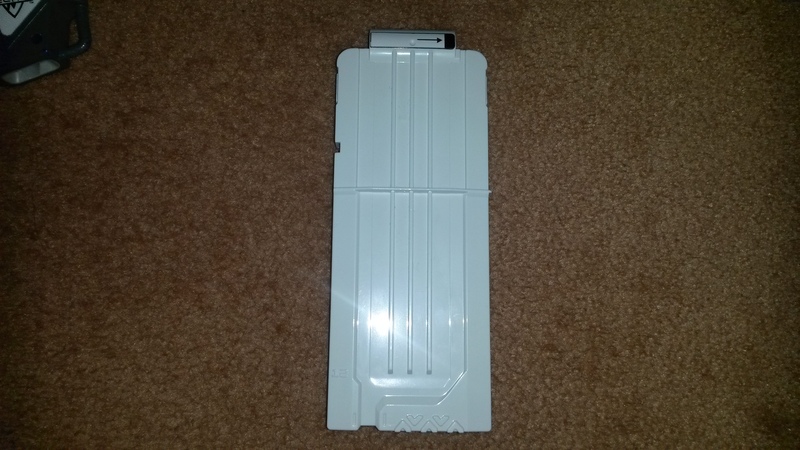 It also helps to emulate the back section of the F-11D. 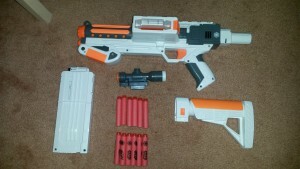 Darts included with the Deluxe Blaster. 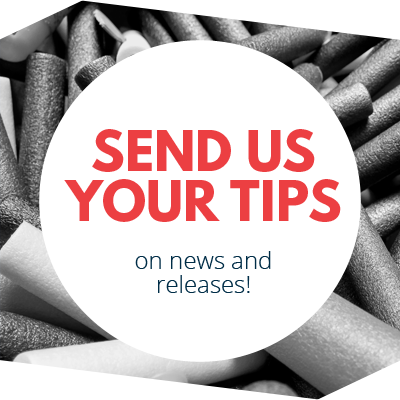 The darts are still Elite-style darts, however are slightly different aesthetically. Obviously they’re red with red heads, but the heads are also transparent. 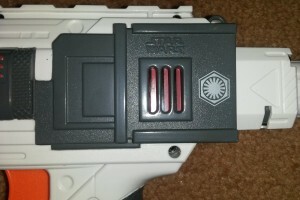 Half of the darts also have the First Order symbol, and the Star Wars and Nerf logos printed on in black. 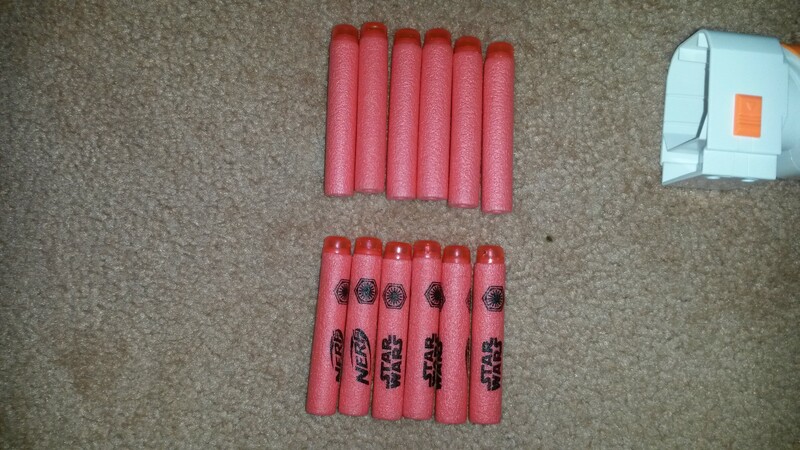 Obviously none of that affects performance, but it’s cool to be firing special red darts. 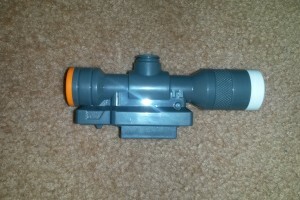 Left side of the scope. 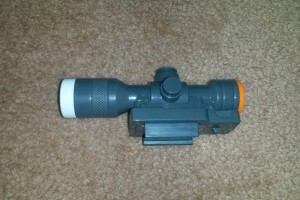 Next to an N-Strike Tactical Scope. 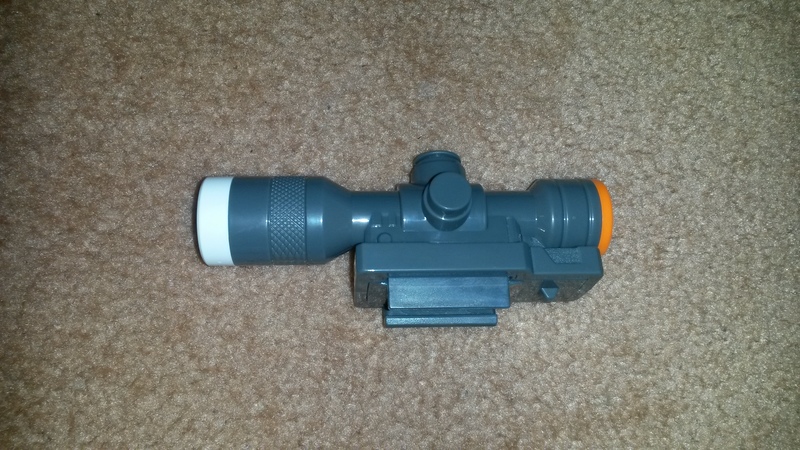 The scope is a pretty basic and very small piece, it’s just a hollow grey tube with a notch at the front. 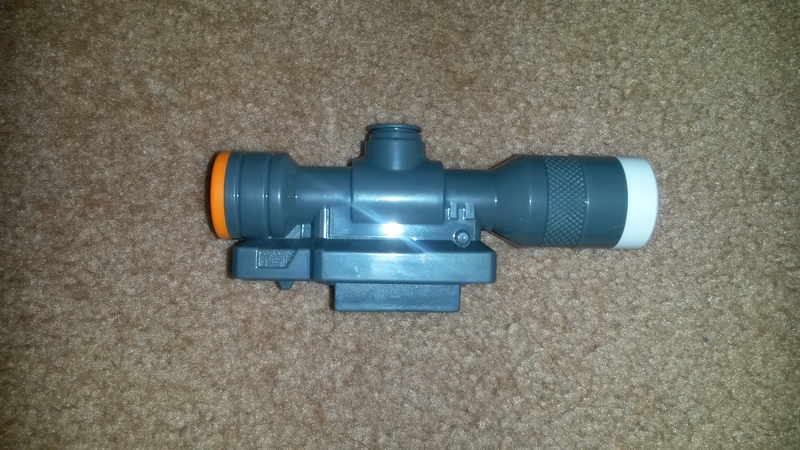 It looks pretty good and is reasonably accurate to the F-11D’s scope. 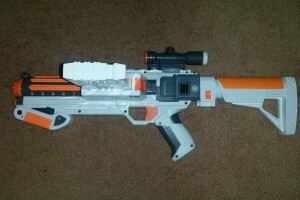 Left side of the stock. 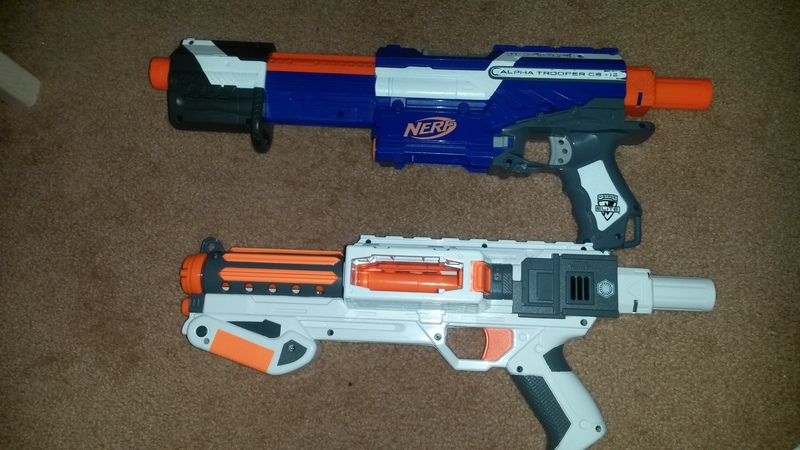 Next to a Retal stock. 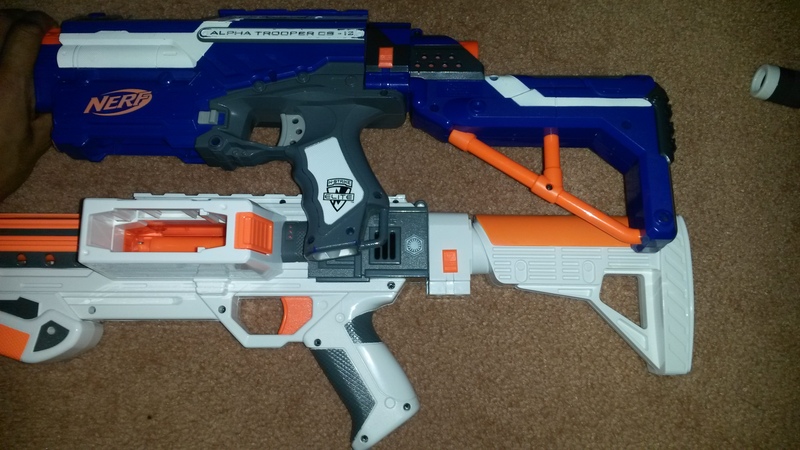 Deluxe Blaster w/ stock next to an EAT w/ Retal stock. 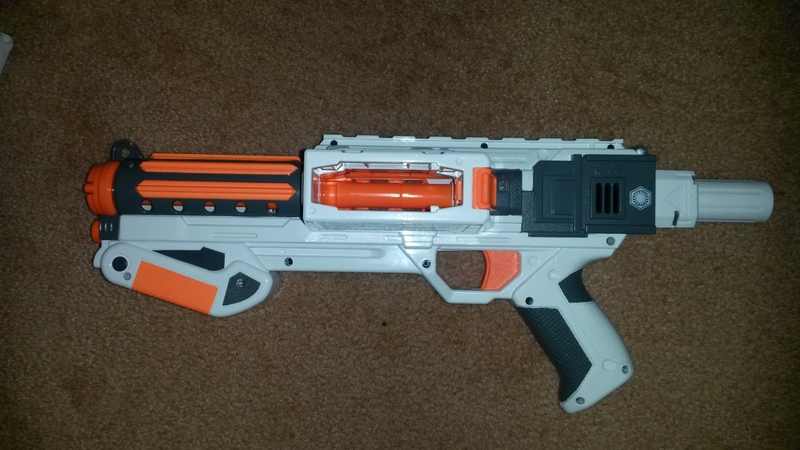 The stock is quite a boring piece. It doesn’t extend, it doesn’t hold clips (mags) or darts, it doesn’t do anything special. 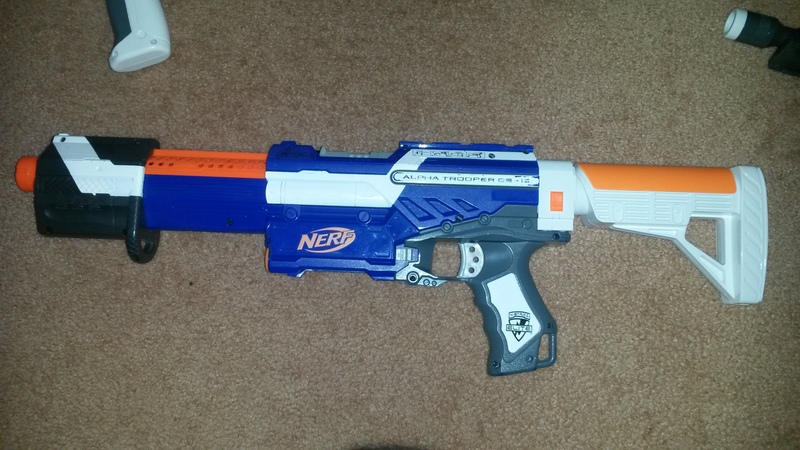 It’s also ridiculously short, being shorter than even a Retaliator stock. 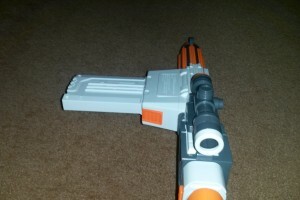 However this shortness is partly made up for by the design of the blaster itself. 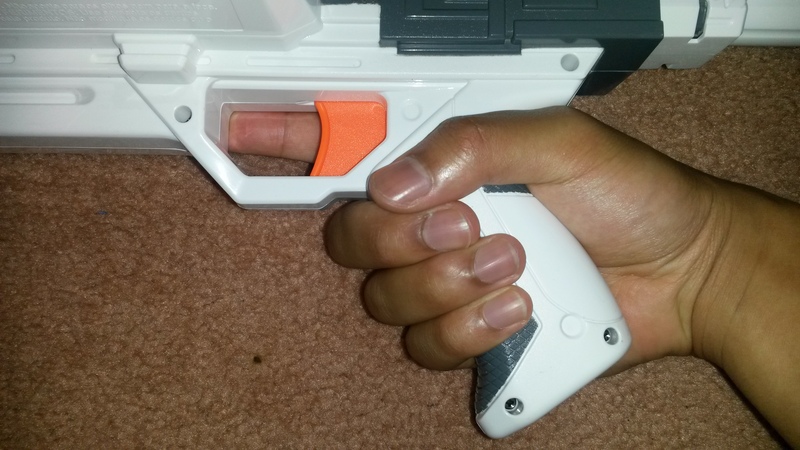 The Stormtrooper Deluxe Blaster’s stock attachment point is further back than usual, giving it more length than it would normally have. 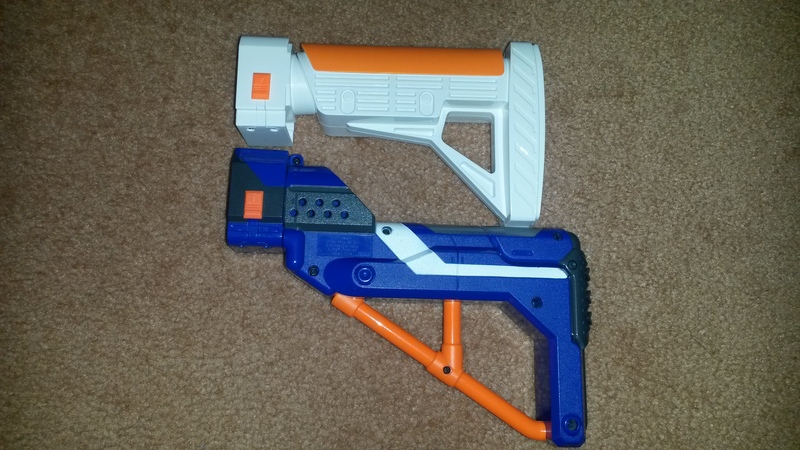 As is, the length of the stock on the Deluxe Blaster is borderline usable, however on any other blaster it’s pretty much unusable. 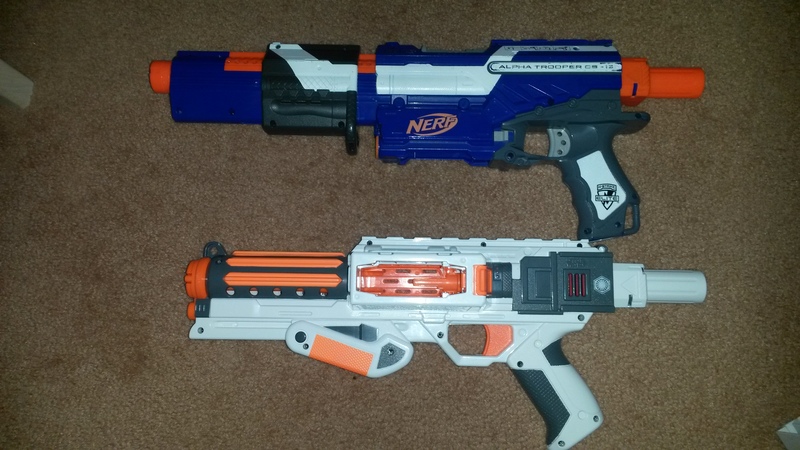 A longer stock would have been highly preferable. 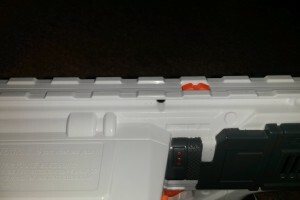 Right side of the clip (mag), note that it isn’t transparent. 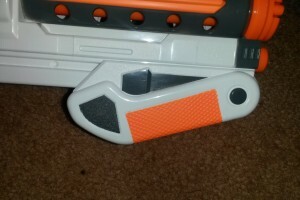 The clip (mag) is a pretty standard 12 dart clip (mag), the only differences being obviously the colour, and that it lacks the transparent right side. 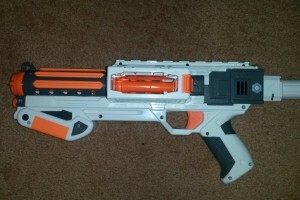 Interestingly, I found that it could also hold 13 darts comfortably. 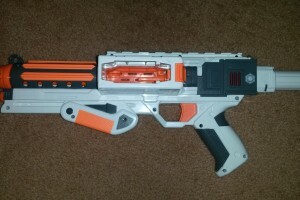 Left side of the full blaster. 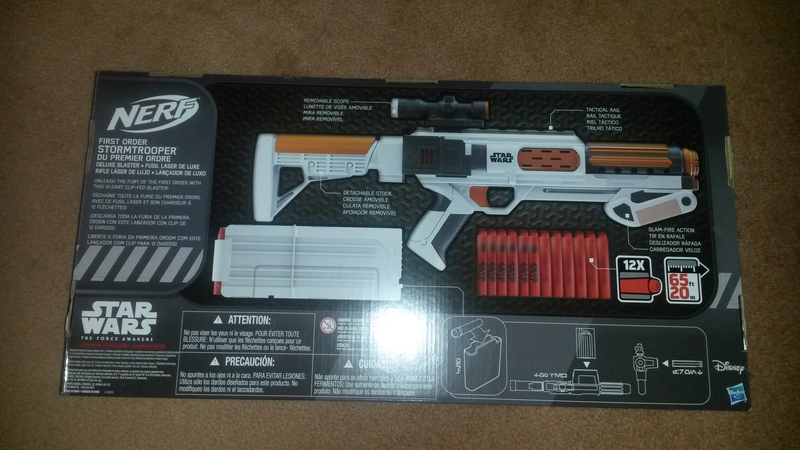 So here’s the complete Stormtrooper Deluxe Blaster. 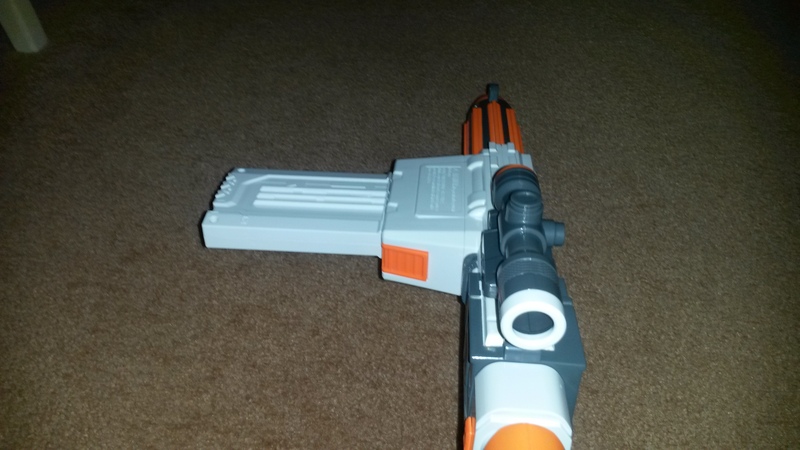 It’s a pretty good looking blaster overall, it has a decent colour scheme and looks quite similar to the source material while being distinctly toyish. 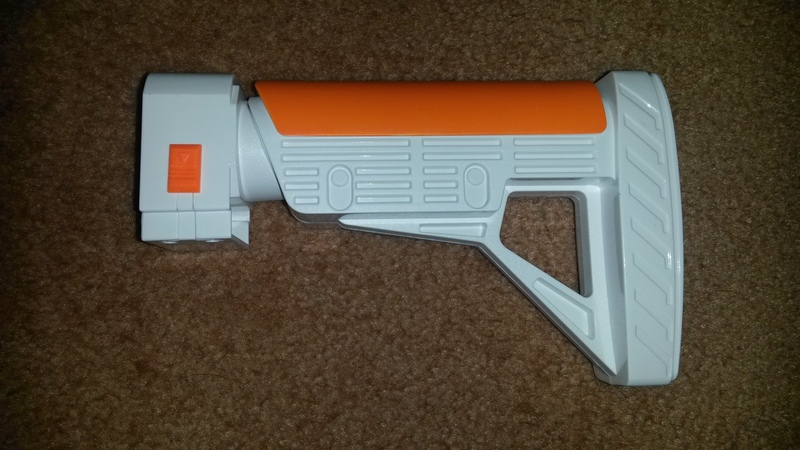 I think in terms of accuracy it does well enough for a mass produced, firing toy blaster. 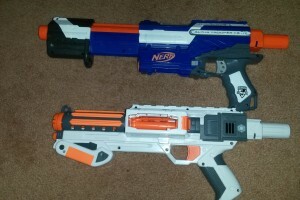 Major flaws are of course the colour scheme, overall size and the magwell being on the left instead of the right. If you’re going for a perfect F-11D replica, you’re probably best off making your own. 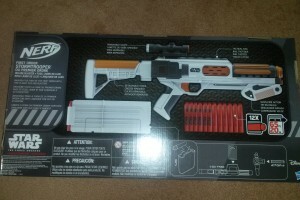 FPS shot of the Deluxe Blaster. 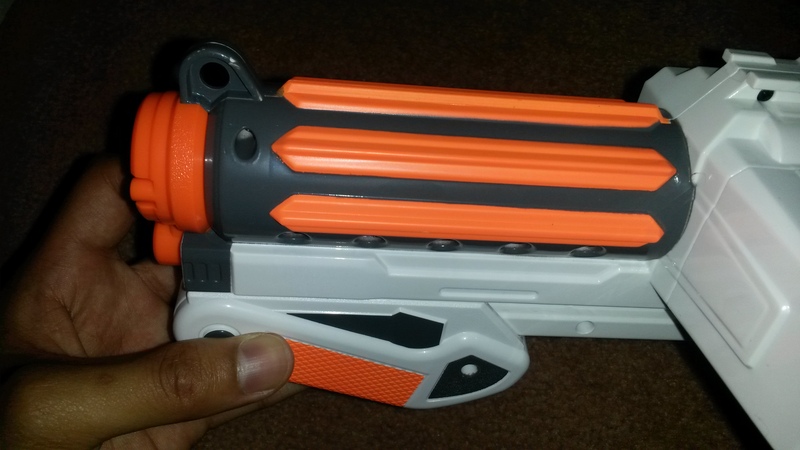 Range is decent for an Aussie release blaster, around 11-12m parallel to ground. 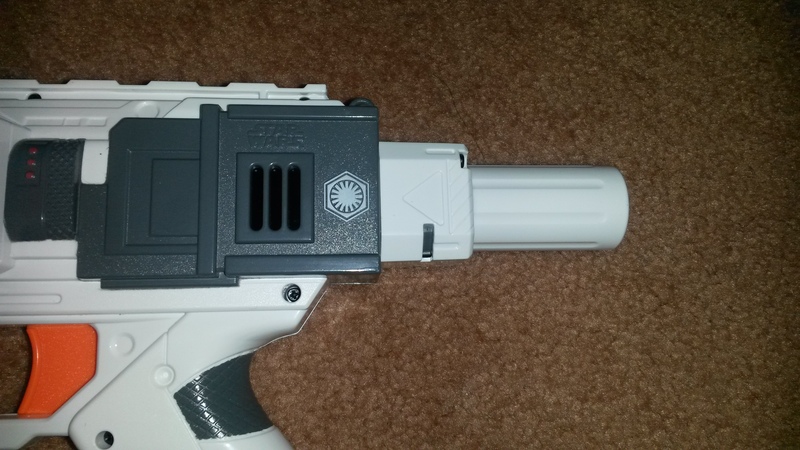 This puts it on the upper end of grey trigger Elite blasters. Accuracy is also decent. At an ~8m range, almost all darts will travel through a regular sized doorway (which I use as my standard accuracy test). 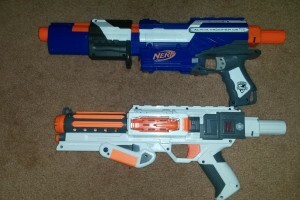 The darts do still spread out a little, and Elite dart veering still occurs, but overall accuracy is better than regular Elite blasters. 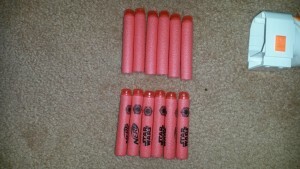 Rate of Fire is quite good, I can get 5-6 darts per second off thanks to slam-fire. 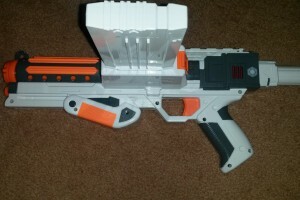 This is beaten only by semi- and full- auto blasters, and the flywheelers need to be upgraded to sustain a higher ROF. 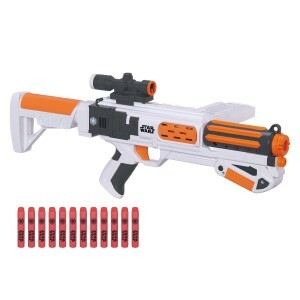 The Stormtrooper Deluxe Blaster performs the same role as any pump action clip (mag) system blaster – a solid all round springer blaster. 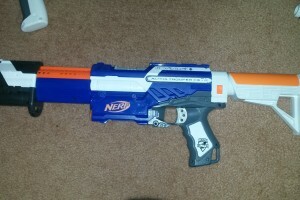 It is relatively easy to use, decently powerful, sufficiently accurate and has a high enough ROF for most situations. 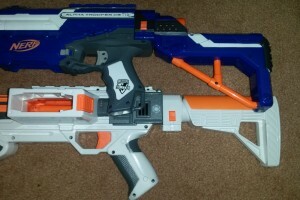 Naturally it can get beaten in all categories by certain blasters, but pump actions are usually some of the best all round blasters you can get. 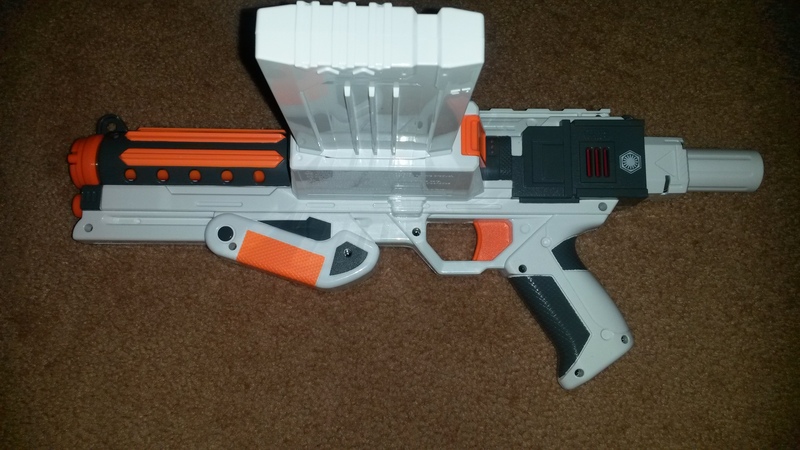 The side magwell may take a little getting used to, but besides that, if you’re familiar with Nerf’s clip (mag) system, you’ll be able to use the Deluxe Blaster without issue. 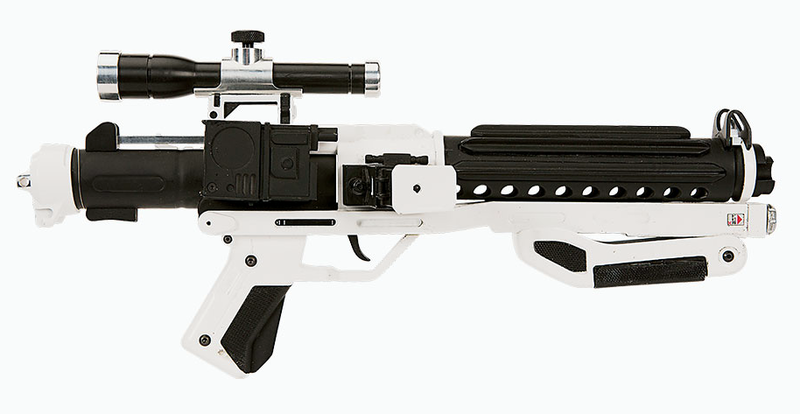 The Stormtrooper Deluxe Blaster can be found outside of sales for about 70AUD at BigW, which is a substantial amount. Worse, outside of BigW’s limited stock, your only other choices are Myer and ToysRUs, which stock it for 80AUD or more. 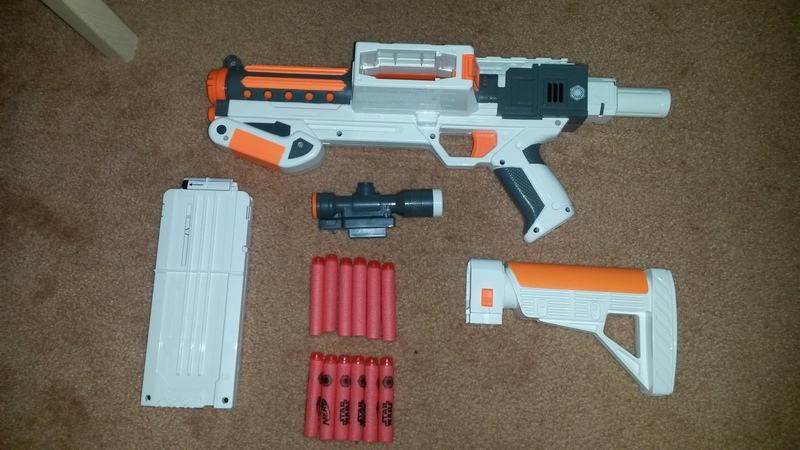 The Elite Alpha Trooper was 30AUD, as are Retals currently. 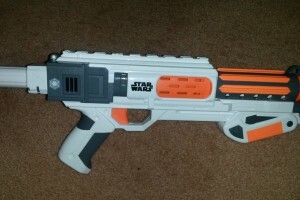 The incredibly high price is primarily due to being a Star Wars branded product, which is unfortunate because without the Star Wars brand, I expect it would be priced at 50AUD or less. 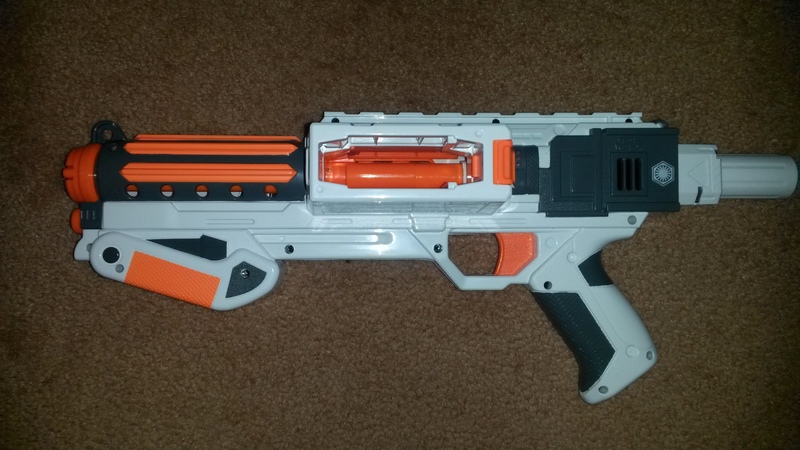 While the Deluxe Blaster is a fun, awesome looking and quite well performing blaster, I cannot properly recommend it because of its extremely high price. 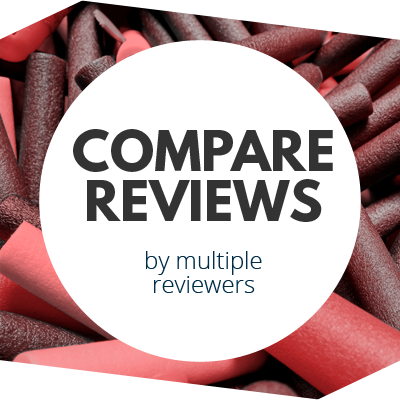 I would only recommend it if you can get a substantial discount (I would pay an absolute maximum of about 60AUD). 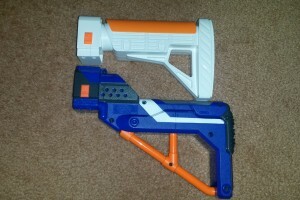 The Stormtrooper Deluxe Blaster is very similar to the Elite Rampage, and has similar (though not identical internals). 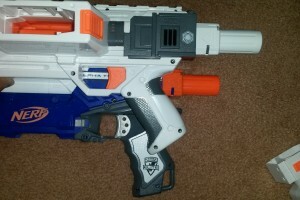 It accepts the same spring upgrades as the Retal/EAT/Rampage/Slingfire and can be boosted up into “superstock” viable territory with a new spring. Not much else can be done (or needs to be done for that matter) internally unless you want to try a brass breech, but if you’re looking to compete in superstock, a new spring is all you’ll need. 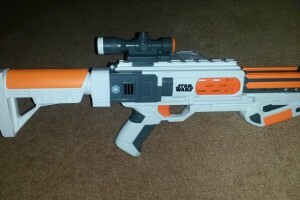 This entry was posted in Dart Blasters, Reviews and tagged blaster, deluxe, first order, review, star wars, stormtrooper on January 5, 2016 by Outback Nerf. I bought mine in BigW, otherwise they are/were available at ToysRUs and Myer, though I haven’t seen stock for them since before Christmas. Thanks. I can’t find them on the websites at the moment, but will try again later. Only problem with Amazon for us Aussies is the shipping tends to be hilariously, obnoxiously high, because US to Aus shipping is awfully expensive.